Two sisters, one from a megacity and one from the wilderness, work together to protect the wilderness and the reintroduction of wolves from a group more interested in private property than public good. In a future Earth that's run by brilliant green cities separated by open land held in common for the good of wild things, two sisters must work together across and between the vastly different environments to root out dangers to both. They must protect the cities and the wild from the Returners, who prefer the toxic past to the difficult present. The older sister, Lou, her protector Shuska, and biologist friend Matchiko have reputations as successful rugged environmentalists. They must stay safe, listen, work, and sleuth out hidden nests of Returners. Oh, and save a few wolves along the way. In the meantime, Lou's younger sister, Coryn, is learning that working for the most powerful woman behind the scenes in a megacity is far harder than it looks. When the Returners threaten the city, the sisters must find a way to preserve both their ways of life. 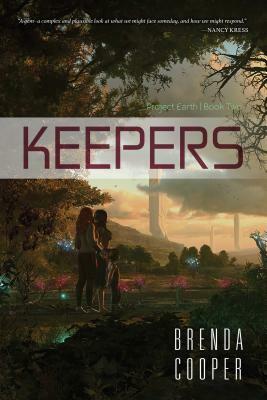 Keepers asks, Do humans have enough creativity, responsibility, and generosity to survive? Brenda Cooper is the author of Wilders, Book One of the Project Earth series; Edge of Dark and Spear of Light, Books One and Two of The Glittering Edge series; The Creative Fire and The Diamond Deep, Books One and Two of Ruby's Song; and the The Silver Ship series. Her most recent short-story collection is Cracking the Sky. She is also the author of Mayan December and has collaborated with Larry Niven (Building Harlequin's Moon). Cooper is a working futurist and a technology professional with a passionate interest in the environment.